One of the best parts about working at a bead store is meeting local artists and seeing their creative projects. 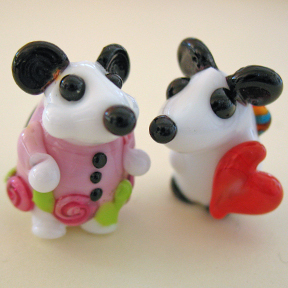 The world of art beads is especially exciting, and we completely fell in love with Denise Annette’s adorable lampwork glass critters. A Washington State artist, Denise has built a strong presence on Etsy, becoming their #4 glass-seller! Her work can be found at DenniseAnnette, or you could check out her Blog. Denise’s little lovelies will be available for sale at the Bead Bazaar through the end of May, so make sure to come by; you may just fall in love! Below is an interview conducted with Denise. A: I work with soft glasses, like SodaLine glass and Bella Donna Glass. I also love the metalic glass from Double Helix Glassworks. 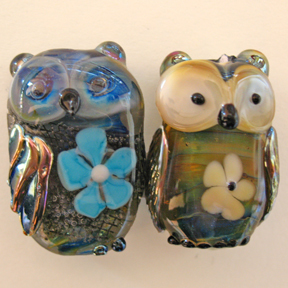 A: What I do is sculptural lampwork, particularly making animals, like owls and mice. I’m totally self taught, learned it all through trial & error; now I make all of my own latticno cane and I have taught classes in the past. I just got an electroforming kit, so I’ll be learning how to electroform on beads. Q: How long have you been making beads? A: I started in 1997, so 16 years. A: I was a pediatric nurse for many years, but then was involved in a serious car accident, and as a result I couldn’t walk for almost 2 years. I started doing beading during this time, to keep myself busy and to remind myself that I could still do and create. I wanted to buy lampwork beads, most of what was around at the time were really large sized, bulky and gaudy, so I couldn’t find any that I particularly liked. I took a class at a local bead shop on making glass beads, using a lampworking torch. I just sat down and “did.” After doing this a while an x-ray tech at my doctor’s office really liked my work & encouraged me, so I would sell my made jewelry every time I went in for a doctors appointment This led to a jewelry party and I’ve been selling my work since then. A: Whimsical; they make me feel good & make me smile. The beads have a lot of personality, so they are their own little characters. Q: We noticed that all of your critters are named. How do you choose their names? A: I call my mice “les petits souris Frances”, or “little French mice”. They all have French names, which plays into my heritage since my father was French. For owls I like old fashioned-names; I see owls as old & wise, so I want to play with this. A: I love nature and animals, and have two miniature daschunds that are always in the studio with me. I feel that I was led to beading as a gift from God to help me feel better. I love working with my hands and make beads everyday! I like being able to take nothing & creating something joyful from it. If I have a stressful day, it makes me feel better to light my torch- it’s active meditation. 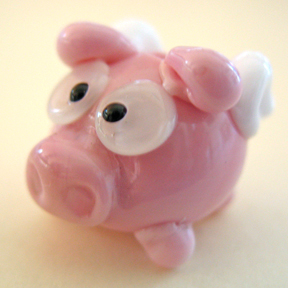 A: Very early on I remember seeing the work of Sharon Peters, who made fun little animals. I thought her work was fabulous & I would love to take a class from her. As it is, not taking any classes means I’ve really been able to create my own style, rather than emulating the work of someone else. Q: What other hobbies or activities do you enjoy? A: I love baking, knitting, crocheting, reading. I just recently took a pottery class and made – owls, of course! I really liked sculptural pottery. A: I really just want to continue to improve my technique. I’m very happy to stay at home & sell beads on Etsy rather than doing shows. I hope to keep selling well on Etsy- I’m currently in their top 1000 sellers, and the #4 glass seller.